Life can get pretty boring sometimes. There’s simply no avoiding it. The best any of us can hope for is to find an ally in the battle against boredom and stick to him or her like glue. Lots of couples do silly things to amuse and distract each other, though rarely do such inside jokes end up actually amusing anyone else. 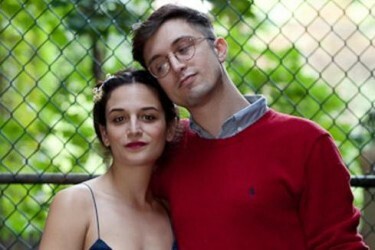 But over the past year, Jenny Slate and Dean Fleischer-Camp have watched as their little pastime project blossomed into a bona fide phenomenon. 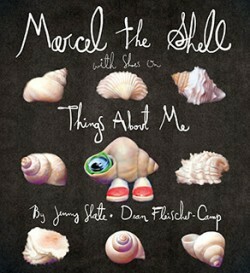 If you haven’t heard of “Marcel the Shell with Shoes On” by now, it’s not for lack of opportunity. The short, charming character the couple created together has traveled far and wide since debuting online last August, screening at film festivals around the world and racking up over 14 million YouTube hits. Now, with the November release of a Marcel the Shell picture book, a video sequel and an upcoming TV series, the co-habitating couple have turned their microscopic sea fossil into a larger-than-life enterprise. It might have remained just something fun to do in private, had they not previously promised friends that Dean would create a video for a comedy show in Greenpoint. They decided to put something together built around an interview with the budding character. It was then only a matter of deciding which inanimate object would best embody the little guy’s essence. “Shells are the jewels of the sea,” Slate says. “I say it as a joke, but I really do mean it. Dean was very sweet to make Marcel’s body out of a shell. To me, it’s a symbol of the most natural beauty, and a very intriguing and unique beauty as well.” Marcel is a vaguely croissant-shaped anthropomorphic shell with a single green-framed googly eye on the right side. While the voice is pure Jenny Slate — untreated and unenhanced — Marcel has a digitally supplied mouth that appears when he speaks. He also wears tiny pink shoes — it’s almost alarmingly adorable. The video opens with Dean’s disembodied voice asking Marcel questions from off-camera, prompting answers that reflect an attitude of childlike playfulness, alongside a keen acceptance of one’s physical boundaries. The upbeat exoskeleton exudes naked joy when describing the diminutive building blocks of his miniature galaxy. “Guess what I use as a helmet?” Marcel asks. The answer is a lentil. Fleisher-Camp and Slate conceived, produced and then screened Marcel in front of an audience, all in a span roughly five days. Based on a strong reaction from the crowd attending SuperShow at Coco66, the couple decided to put the video online. Gabe Delahaye, a friend and fellow comedian, soon embedded it on Videogum, prompting overwhelmingly delighted responses across the board. Marcel’s ascent was underway. “It was strange and very beautiful to see so many personal, positive reactions happening together,” Slate says of the short’s swift, ecstatic reception. It was at about 30,000 views on Youtube when she and Fleischer-Camp realized their labor of love had exceeded their modest expectations, establishing a strong connection with viewers on a large level. Marcel had only been out for about a month when the pair began meeting with a slew of publishers. A two-book deal with Penguin Young Readers Group imprint Razorbill soon followed, perhaps inevitably. In the book, the familiar apartment setting is immediately rendered exotic through the eyes of its tiny tour guide, who dispenses tall tales about his surroundings and offers an occasional aphorism. The everyday objects Marcel interacts with — a colander, a high-heeled shos — :are composed of soft-focus still-life oil paintings that make him seem like less of an object in contrast. Thus far the reception has been positive, and it seems possible that Marcel may one day become a classic children’s book character. The second book will not be released until fall of 2012, and details about the TV show are being kept secret for now. However, the long-awaited second Marcel video appeared online unannounced November 15th. Predictably, word of mouth spread much faster than it had the previous year, and “Marcel the Shell with Shoes On, Two” attracted millions of viewers almost instantaneously. Before debuting this follow-up online, though, Jenny and Dean brought it along with them on their book tour. “We wanted to play the second video at the live events before we put it online,” Slate says, “as a thank you to the people who came out and supported us.” The limited live screenings of the new piece also gave the filmmaking duo rare observational access to people actually reacting to it, which helped them tighten up the editing. The live crowdsourcing opportunity even led them to change the ending before sharing it with a mass audience online. Additionally, the exclusive video and overall intimacy of these book events helped seal a bond between the creators and their core audience — a group that now ranges from children and college students to marketing managers and grandparents. At a recent event at the Powerhouse Arena in Brooklyn, when Jenny read the entire book in Marcel’s otherworldly voice, the crowd hung on every word, laughed frequently, then waited in a long, orderly line for the chance to get their copies signed. These fans seemed eager to connect with her and Dean in a way that nearly mirrored the connection the two have with each other — a rapport that made the whole Marcel sensation possible in the first place. Joe Berkowitz is a writer living in Brooklyn, if you can even believe that. He also has a tumblr.